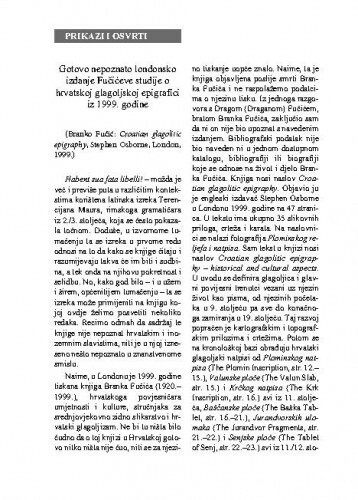 NapomenaPrikaz knjige: Branko Fučić: Croatian glagolitic epigraphy, Stephen Osborne, London, 1999. NaslovMilan Moguš i Bašćanska ploča / Tomislav Galović. Sadržaj(505)Sadrži i prilog na str. 280-285. OpisU članku se donosi pregled istraživačkih rezultata Milana Moguša (1927. – 2017. )vezanih za proučavanje Bašćanske ploče, toga našega najznačajnijeg nacionalnog spomenika na hrvatskome jeziku i glagoljičkom pismu iz razdoblja hrvatskoga kraljevstva i neposredno nakon njega. U osnovnim crtama rekapituliraju se znanstveno-stručni rezultati o Bašćanskoj ploči te se ukazuje na otvorena pitanja i probleme, kojima je MilanMoguš prišao i ponudio pojedina rješenja, poglavito s jezikoslovnoga gledišta. Prikazatće i analizirati njegovi radovi od kojih posebno treba izdvojiti sljedećih pet: 1) Riječdvijeo Baščanskoj ploči (u povodu 890. godišnjice) (1967.; pretisak 1988. 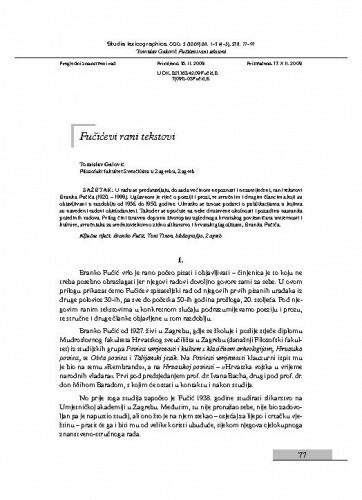 ), 2) Baščanskaploča u našoj znanstvenoj literaturi (referat 1989., tekst 1997. ), 3) Povijest hrvatskogaknjiževnoga jezika (1993., 1995.2, 2009.3), 4) Filološki pogled na starohrvatske pravne spomenike (2000.) 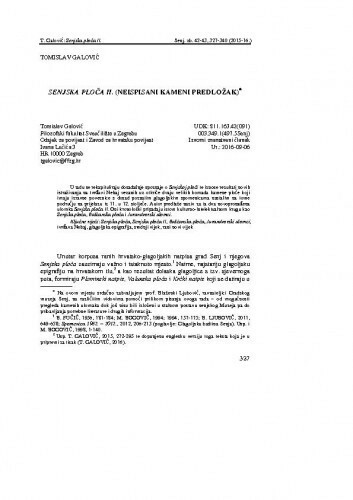 i 5) Kako pročitati Baščansku ploču (2011., prethodno objavljeno u Senjskom zborniku, sv. 37/2010). 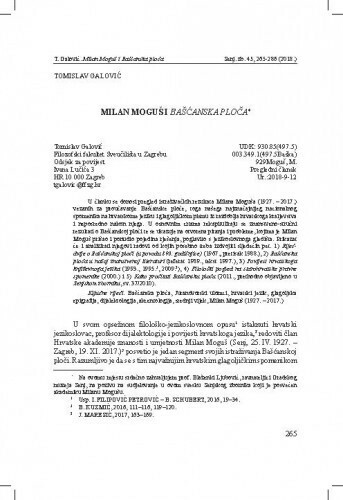  Presented in the article is an overview of the research results of Milan Moguš (1927 – 2017) connected to the study of the Baška tablet, our most significant national monument in the Croatian language and Glagolitic alphabet from the period of the Croatian kingdom and directly after it. In his extensive philological-linguistic opus the distinguished Croatian linguist, professor of the dialectology and history of the Croatian language, full member of the Croatian Academy of Sciences and Arts, M. Moguš has dedicated one section to his investigations of the Baška tablet.It is understandable that this the most important Croatian Glagolitic monument is mentioned at the beginning of his scientific specialist paper as well as in his former scientific opus, especially when he had written a synthesis of the history of the Croatian literary language. The scientific results of the Baška tablet are recapitulated and outlined, and it points to the open questions and problems, to which M. Moguš has approached and offered, mainly from a linguistic point of view,some solutions to. His papers are presented and analysed, of which the following five should bespecially noted: 1) ‘A word or two about the Baška tablet (upon the 890th anniversary)’ (1967; reprinted 1988), 2) ‘The Baška tablet in our scientific literature’ (paper 1989, text 1997), 3) History of the Croatian literary language (1993, 19952, 20093), 4) ‘Philological view of Old Croatian legal documents’ (2000), and 5) How to read the Baška tablet (2011, previously published in the Senjski zbornik, issue 37/2010). 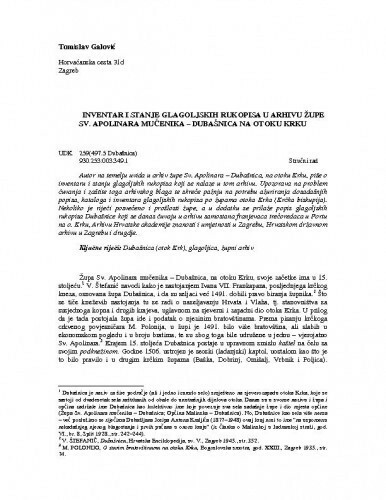 To end with we can conclude that M. Moguš has contributed themost to the study of the Baška tablet, right in the field of the history of the Croatian language – the phonology and accentology, and his paper is and will be a reliable starting block for all future investigations in this scientific area, and his results should not be bypassed and/or disregarded.